Bushed areas seem very dry from areas i've seen across the west both flying and on the ground. Its been a dry year and practically no major rain fall events, say 30mm+ which have the biggest impact of how 'wet' the bush is. Talk that Night fire fightning helicopter will be deployed to this fire, even if not needed fire will be used for training. May well be the first fire in Australia to fire bombed at night. BULBAN RD LITTLE RIVER just went make tankers 20 I think, only just got the radio up but looks like 20 paged. 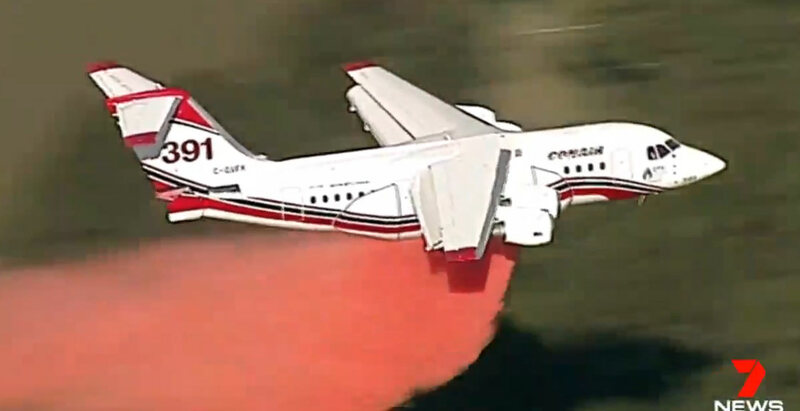 Further, fire has jumped BULBAN RD LITTLE RIVER, make tankrs 40 at least, fire running very hard toward little river township, request emergency warning and text to people in area, spotting and request multiple aircraft including large air tankers if available. Fire to impact Geelong line, request line closure. 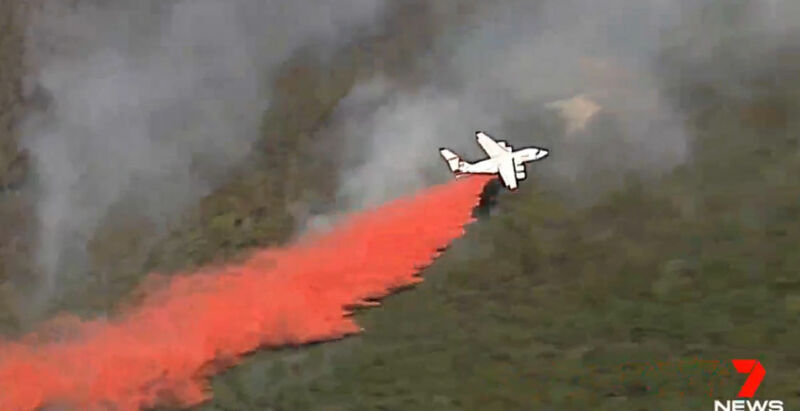 It is strongly recommended that you Evacuate Now if you are located in Mambourin, Manor. Why, fires had to be on Hot Day seem odd than any other day. I am sick of media don't say how and why fires started. This Watch & Act message is for Mambourin, Manor. There is a grassfire at LittleRiver that is not yet under control. This Watch and Act replaces the previous evacuation notice. Just had a listen to the scanner archive for the start of the fire in little river, original fire involved 3 separate fires which joined, Little River tanker was on scene within 8 mins of the 000 call requesting 40 tankers and fire was already 800m long on multiple fronts. Fire had moved from Kirks Bridge Road, crossed Edgars road and was about to cross Bulbans Rd. Also quite an extrodany call from Little River Captain, sounds like they almost had it held at Bulbans Rd radio but in the middle of a road call they discovered it had jumped the road behind them, knew they had lost it at that point. Numerous fires starting North of Bairnsdale and twds Orbost and Cann River, large amount of lightning in area, aircraft up working multiple fires and others doing recce's. 8 Fires at current count. The is some rain with these storms (7mm at Orbost) but lightning is occurring outside the rain core. This message is being issued for East Gippsland East of the Snowy River. 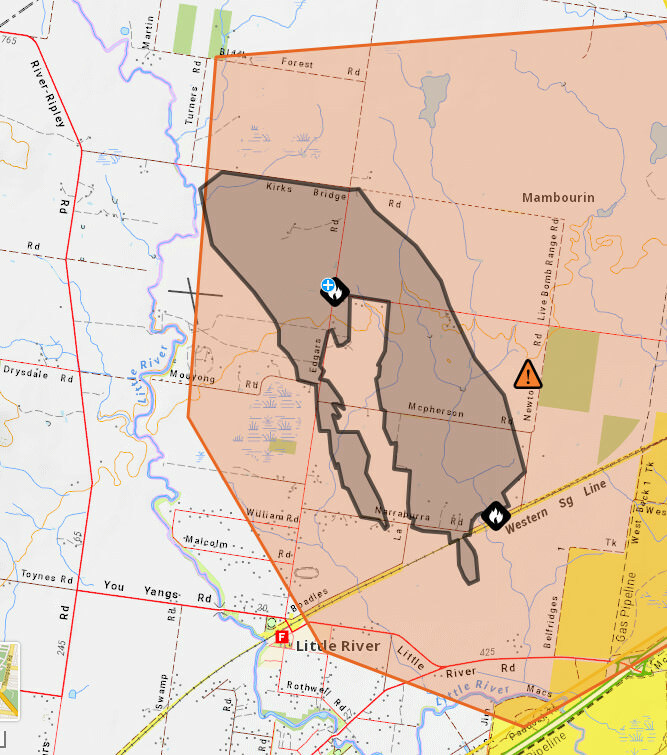 There has been a band of lightening move across East Gippsland and a number of bushfires have been ignited. Individual messages are not being created due to the number of reports. Firefighters are currently responding and dealing with each report. looking wet into next week. although 31C Wed. is a bit hot. have further thunderstorm activity Thur/Fri/Sat. Looks like everybody behaving no bad bush-fires so far this week good to hear for Victoria. So wait hear how ARARAT-MOYSTON RD MOYSTON started by accident or fire bug. 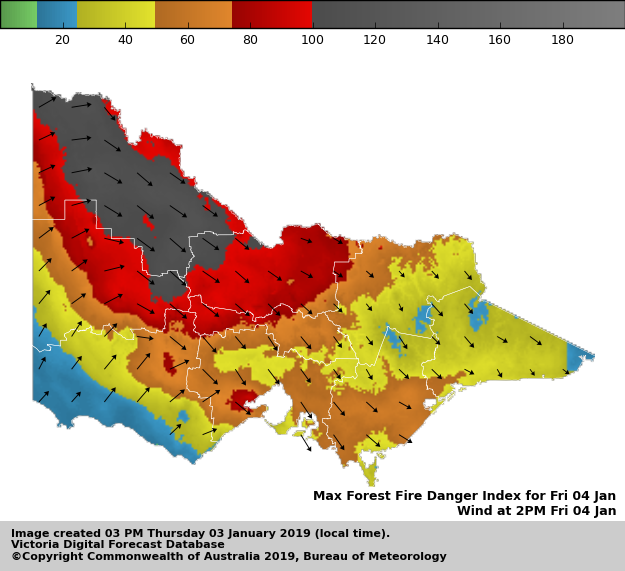 Though the FDIs forecast for tomorrow are not at the upper end of the scale for Central and W&SW Gippsland, the Severe Weather Warning for the dry wind change means (particularly if a fire is running at the time) a challenging period late afternoon and evening. "A strong cold front will cross the State Friday expected to reach Melbourne around 4pm. DAMAGING WINDS, averaging 60 to 70 km/h with peak gusts of 90 to 100 km/h are expected with and immediately following the cool change Friday afternoon across parts of the Central and West and South Gippsland Districts. Winds are expected to ease around 2 hours following the passage of the front. Locations which may be affected include Geelong, Melbourne, Bacchus Marsh, Morwell, Traralgon and Sale." I see BOM now going for 43C at Sale tomorrow. 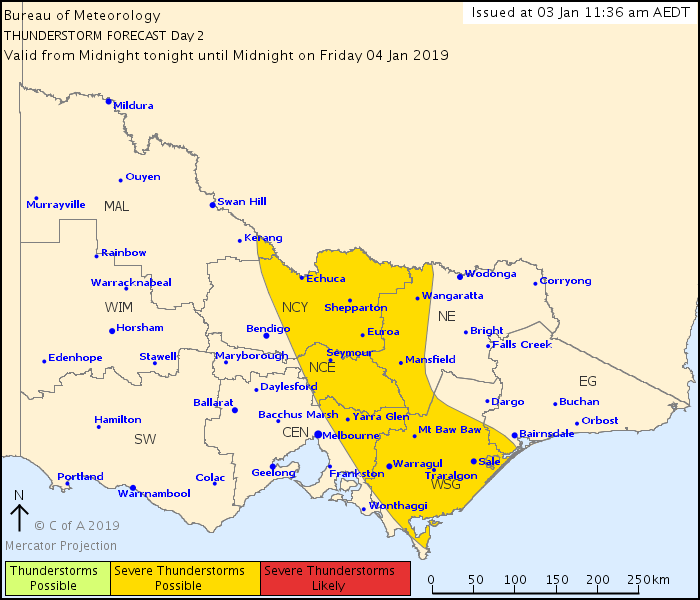 For Gippsland, the thundery(?) change looks to be circa 6-8pm going by 750RH & 300TotalTotal charts. I am shocked see my town get 45c tomorrow, feels like broken records to some towns of Victoria. Some massive FDI's out there tomorrow, reaching to the 100s in some areas of the Mallee and Wimmera, some places will have their highest ratings since Feb 9 2014. Only thing stopping higher is most areas still haven't recovered fully from the rain mid December with some moisture still present in heavy fuels, tomorrow will significantly change that going forward. Isolated very high-based thunderstorms a risk tomorrow afternoon with the passage of a wind change. Damaging winds are a possibility with any storms that do develop. A severe weather warning is current for West and South Gippsland and Central forecast districts for damaging winds following the cool change. If any significant fires develop tomorrow then there is also a risk of thunderstorms forming over the top of those fires. Mhmm don’t want the above senario logansi! 1 start from that cell last night near Goongerah, doesn't seem to be doing to much right now 2 fixed wing bombers working on it. Isolated high-based thunderstorms are possible on/west of the frontal passage this afternoon. 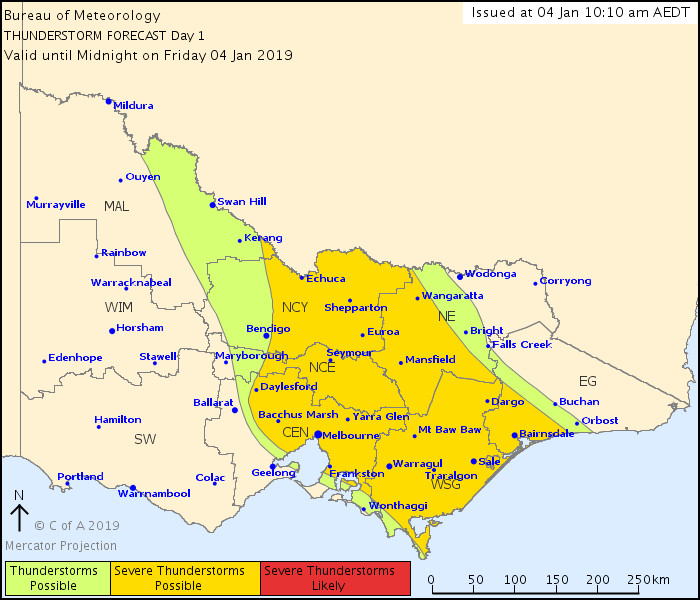 Damaging wind gusts are a risk in the indicated area from mid to late afternoon, particularly through south central and southeast Victoria, as even winds away from storms are expected to be squally with the passage of the front (Severe Weather Warning current for parts of Central, West and South Gippsland, East Gippsland districts). If fires are ignited across the State, conditions are favourable for storms developing over these fires (pyrocumulonimbus).